Irish-born BBC news editor Fergal Keane has spoken of the pain and loneliness of growing up in a household with an alcoholic parent. The BBC News Africa editor, whose late actor father Eamon was an alcoholic, welcomed a new service from Alcohol Action Ireland for children. "As someone who experienced parental alcohol misuse while growing up, I am delighted that Alcohol Action Ireland has launched the Silent Voices initiative, which will start a conversation and foster a better understanding of what I believe is a deep societal issue with alcohol. "For those who know the loneliness, the confusion and pain that can come from being the child where parental alcohol misuse is a pattern in their life, Silent Voices will be a vital resource: it will tell people that they are not alone." Silent Voices aims to end the silence of this experience, by promoting an understanding of the adverse impacts of parental alcohol misuse on the lives of children, including those who are now adults. It also plans, with existing service providers, to secure supports for those who have lived, or are living, with parental alcohol misuse. 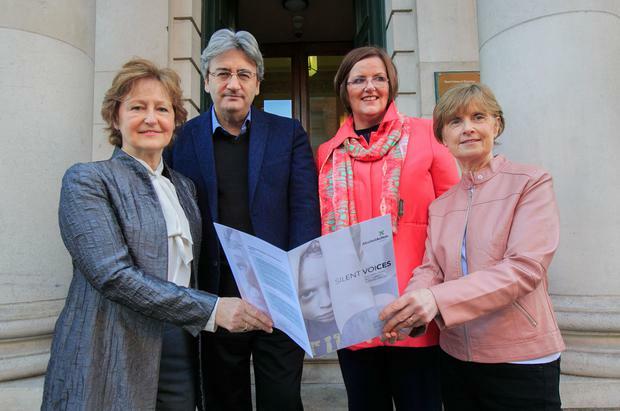 The driving force behind Alcohol Action Ireland's Silent Voices initiative are three women who experienced parental alcohol misuse as children: Carol Fawsitt, Marion Rackard and Barbara Whelan. Speaking at the launch, Carol Fawsitt, who is also the chair of Alcohol Action Ireland, said: "Parental alcohol misuse - and its negative impacts on children - is something that rarely gets an airing in Irish society. "Many of us - from all walks of life - have grown up under a shadow of alcohol misuse. "The harms and negative impacts of growing up under this shadow can manifest themselves in different ways, but especially at a time of life change, such as a family bereavement, redundancy or pregnancy. "It's my experience that life change with a backdrop of parental alcohol misuse can take its toll, and services - such as counselling - often don't recognise the link between parental alcohol misuse and trauma in adult children. "For adult children, our message is this: if you are experiencing trauma in your life, seek help and don't be afraid to do so. It is our experience - as the instigators of Silent Voices - that by seeking help, many latent fears and coping mechanisms adopted in childhood can be addressed with significant personal benefits." Alcohol Action Ireland estimates that approximately 400,000 people in Ireland today are adult children from alcohol-impacted families. Recent data from the HSE's The Untold Story indicates that today, approximately 200,000 young children are likely living with and being affected by parental alcohol misuse. "For service providers, a greater recognition of parental alcohol misuse harm is critical. Over the coming years, Silent Voices wants to grow awareness," Ms Fawsitt said.